Louise you deserve every moment of your success, you are a fantastic author and I can’t wait to read Cragside, well done and I hope you write many more fabulous books and thank you for hours of really excellent reading. Just can’t resist you LJ and can’t wait to read ‘Cragside’. Best wishes. I am holding my breath (well figuratively speaking!) for the imminent delivery of “Cragside”. 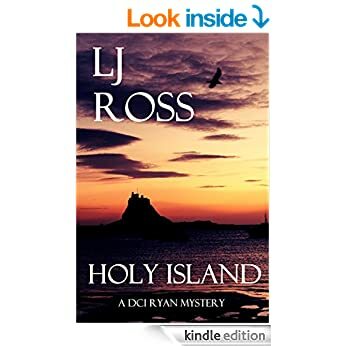 I was hooked from the start – “Holy Island” was utterly gripping and I ordered the entire series even before getting to the last page. Many congratulations on your amazing achievement – please keep DCI Ryan at work. Sending you much love and many thanks from our home in France. Congratulations on your double success. Your story is inspiring. I was drawn to Holy Island by the exquisite cover, and thoroughly enjoyed the story. I’m looking forward to reading more of your novels. Started reading Holywell Island because of its title (all of your titles are places I know and love although I don’t come from Northumberland ) kept reading it because I couldn’t put it down. Read the first 5 of your books in under a week. Good thing there is know body to complain about lack of cooking or cleaning. Have just finished Cragside. Cant wait for the next book! ! I am reading the last in the DCI Ryan series and feeling sad . Also very anxious for your next book. I have really enjoyed your writing and of course your main characters. Thank you for hours of enjoyable reading. Have now read all 6 books find them thrilling can’t wait for the next . I truest enjoyed reading all 6 books. I have been to your part of England and traveled with my friend to all these different places. To revisit them with you has been exquisite, scarey, heart pounding and a desire to keep reading on and on. More please . My marathon read is over and I am relieved and devastated. More more more ! What a trip. Just finished Cragside and loved it. Living near Elsdon I absolutely adore knowing the places and seeing what alterations you’ve made. But most of all as a counsellor I love seeing the psychological reality of everything you write. I am so glad book 6 is not the last! I’m surrounded by dirty washing, cupboards with no food in them and a flashing phone where people have left messages but I am very happily! Truth is I have just finished Cragside. Another fabulous read and loved it as much as the rest. Just cannot set your books down. I am watching out for the next one and might just read the rest all over again in the meantime. Well, as soon as I have caught up on the laundry, gone to the supermarket and cleared the answerphone. Many, many thanks I thoroughly enjoy your work and I hope you never stop writing.